There are seemingly endless options through which homeowners must navigate when buying a new garage door: the style, materials and accessories, just to name a few. But perhaps the most important feature that should top the garage door consumer’s list is energy efficiency. What should consumers look for in an energy efficient garage door? For starters, check out the R-value. R-value is a measure of thermal resistance to heat flow and is how most manufacturers show the energy efficiency of their product. The higher the R-value of a door, the more insulation you’ll get. Second, look at the door’s construction. Well-insulated doors will have a “triple-layer” construction, consisting of environmentally safe polystyrene or polyurethane thermal insulation between two layers of heavy-duty steel. Some insulated garage doors also include a thermal break which is a nonconductive material within the door that keeps thermal energy from passing through, resulting in improved energy efficiency for the home. Well-insulated garage doors should be able to stand up to the most extreme of conditions while simultaneously protecting your garage and the rest of your home. For example, the Heritage 3000 door by Amarr was installed at Mawson Station, a science facility in Antarctica, in 2007. 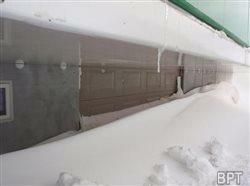 The garage door continues to withstand years of exposure to 100 mph blasts of wind and snow. With protection like that, imagine what an energy efficient door like the Amarr Heritage 3000 can do for your home. Whether your garage door withstands heat, wind, snow, rain, or all of the above, it’s the largest line of defense for your home. Make sure that it’s working hard for you by reducing your home’s energy consumption and providing strong, durable protection from the outside. Your utility bills – and the rest of your (climate-controlled) house will thank you.